The Arts & Makerspaces: Creativity for the Win! The Arts & Makerspaces: Creativity for the Win! Student project in progress during our Cardboard Challenge. Original photo by Diana L. Rendina. I started our Makerspace at Stewart Middle Magnet School in 2014 in part to help bring our school’s STEM theme into our library. But while STEM was definitely an important factor in designing our makerspace, there was another objective for the creation of our makerspace that doesn’t get discussed as much: bringing art back into our school. Four months after I started at Stewart in 2009, our art class was cut in favor of adding culinary arts as an elective. While I was all for our students learning about nutrition and how to cook, I was sad to see one of the only creative outlets that my school offered taken away from our students. We still offered band and orchestra, but for many of our visually creative students, there was no longer a place to express themselves. Enter the Maker Movement and the birth of our makerspace. I certainly don’t think that a makerspace is a replacement for an art class any more than it would be a replacement for a science or engineering class. Nor do I see myself as a replacement for an art teacher. But for a school where art has been cut, our makerspace helps to fill the void and provides our students with an artistic outlet. I love reading books about artists, and one of my favorite features of art books is when you get a sneak peak into the artist’s studio. When you look at these spaces through a modern lens, it becomes clear: art studios are makerspaces and artists are makers. Look at artists such as Nathan Sawaya and his Art of the Brick exhibit. Nathan’s work is composed entirely of LEGOs, and it’s been shown in world-class museums around the globe. Look at the variety of amazing artists in the Exploratorium’s fantastic book, The Art of Tinkering (an excellent resource for project ideas). There are artists working with fiber, paper, cardboard and all sorts of mediums. Read about the examples of public libraries embracing art on the Library As Incubator Project and read about student projects in Laura Damon-Moore’s post, Read, Talk, Make: The Book to Art Club. Makerspaces and art are a match made in heaven, and the library is the perfect place for exposing your students to these experiences. Students getting creative on our whiteboard wall in our makerspace. Original photo by Diana L. Rendina. There are many ways to incorporate the arts into your makerspace and to provide your students with the creative outlet that they need. Quite a few of them will cost you nothing at all, and all of them can create valuable experiences for your students. If you have teachers who teach art, music, dance or other arts classes, invite them to collaborate with you. Work together to teach your students a new skill that they can incorporate into their next project. 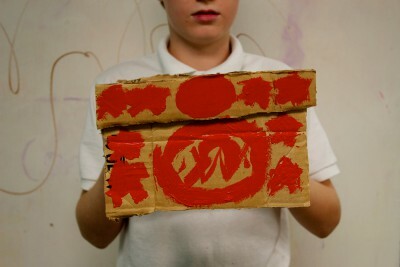 Paper circuits are affordable and can bring a new dimension to student art projects. MaKeyMaKey and Scratch can be combined to program new types of musical instruments. Dance students can learn how to code robots and create choreography challenges with them. After your collaboration, showcase the students’ projects in the library. This will expose other students in your population to the arts and might help to spark an artistic spirit in them. Think about ways that you can change your physical space to allow for everyday creative expression. Our Epic LEGO Wall has become a pixel art haven. Our students love to come in and add their mark, and we’re working on plans for a collaborative LEGO wall mural. 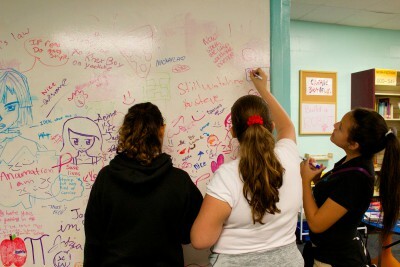 Whiteboard walls and tables can also be amazing art spaces for students. We keep our makerspace stocked with whiteboard markers (they go through them fast! ), and our students are always doodling. We had several students last year that would create “drawings of the day,” which other students would then write comments about. Some students even drew a “like” button next to the drawing so that other students could express their appraisal. 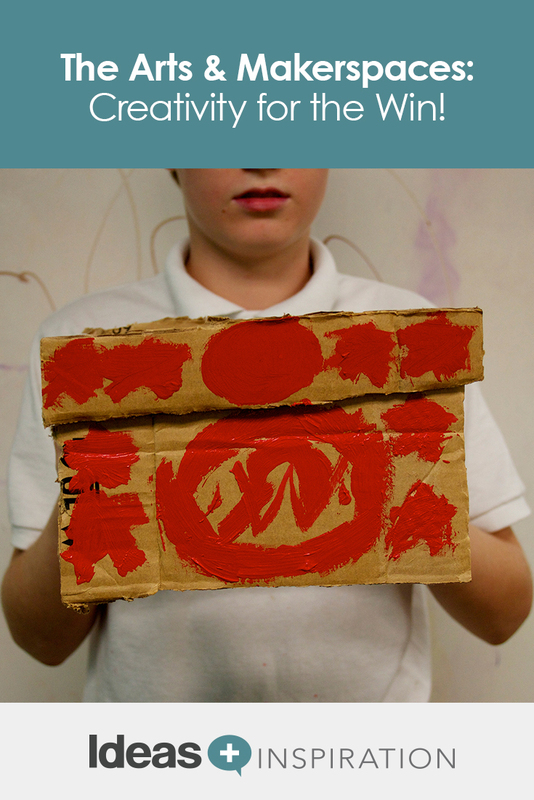 Even if these are out of your current budget, you can still create art spaces for your students. Consider putting out a roll of butcher paper and some markers on a table. You might be surprised at how enthusiastically your students will react. Arts and crafts maker activities such as Perler beads, loom weaving, and origami can also be popular and are very affordable. The Columbus Museum of Art has an amazing area called the JPMorgan Chase Center for Creativity. The entire exhibit is essentially one huge amazing merger of art and makerspaces. One aspect of the exhibit involves encouraging patrons to interact with the art displayed and create their own art inspired by it. At an exhibit based on the new museum building, the architect’s blueprints were shown, along with an artist statement on how the architect likes to play with blocks to get ideas. Right next to this display is a table with blocks where visitors are encouraged to dream up their own building ideas. In other areas of this exhibit, simple materials such as twist ties are provided, and patrons are encouraged to be creative and make something. They can choose to display their work alongside that of other patrons or take their project home with them. This type of experience could be replicated on a smaller scale in your library. Consider showing framed works by master artists and/or student artists and create centers encouraging students to interact with them. Create passive maker stations with design prompts and encourage students to display what they make. This will help to encourage a maker/artist mindset with your students. 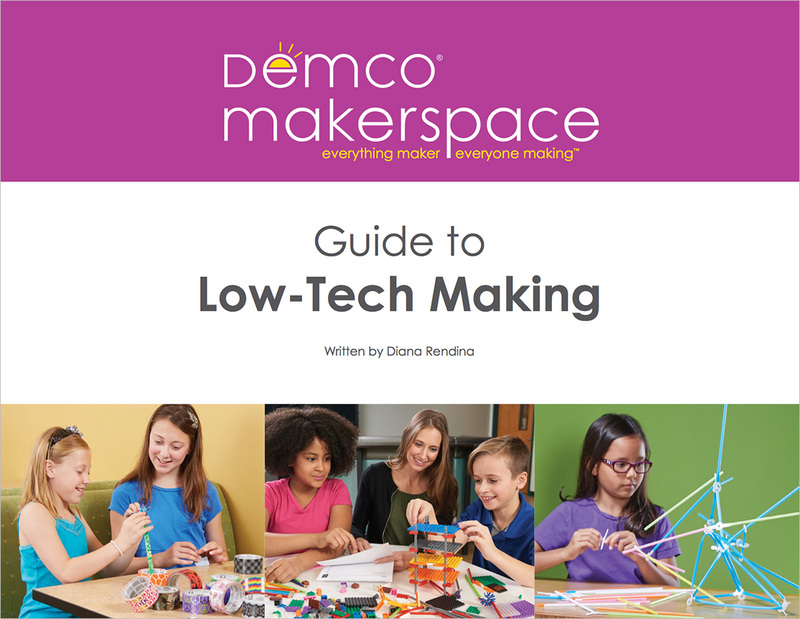 Be proactive in bringing the arts and creative experiences into your makerspace. Now more than ever, students need to have hands-on, creative play experiences across all subject areas. As your students work on projects, they’ll start to see the lines of curriculum blur, as STEM and the arts combine beautifully. So let’s start bringing some STEAM (Science, Technology, Engineering, Arts, Mathematics) into our makerspaces.